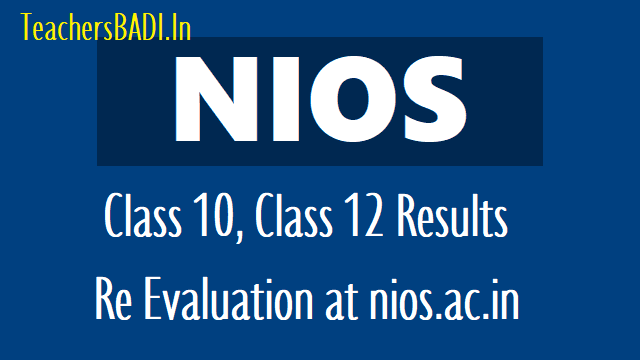 NIOS Class 10, Class 12 Results, Re Evaluation at nios.ac.in: NIOS Result 2018 National Open School Results, NIOS 10th Class Results 2018. NIOS Result 2018: The National Institute of Open Schooling(NIOS) has released the Class 10 and 12 results on its official website. The candidates who had appeared for the October Class 10th and 12th examination this year, can check their results on the NIOS official website - nios.ac.in. Last year the NIOS declared the October Class X and XII exam results on December 6, 2017. The NIOS Class 10 and 12 examinations for the October (second) session were held from October 8 to November 5, 2018. The first session examinations are conducted in the month of April every year. In order to download your NIOS 10th or 12th, October 2018 exam results. Candidates may follow the given steps for checking your results. National Institute of Open Schooling, NIOS has declared the NIOS 10th Result 2018 and NIOS 12th Result 2018. Candidates enrolled in the open school examination can now log on to nio.ac.in to check their NIOS Result 2018. The NIOS Board examination for Class 10 was conducted from March 30 to April 27, 2018. The Class 12 Examination was conducted from March 29 to April 27, 2018. NIOS Result 2018 of Class 10 and Class 12 was announced . Re-evaluation fee is Rs 800 per subject and is to be submitted by June 15, 2018. Re-Evaluation of answer sheets is only available for Senior Secondary Examination only and not Secondary Examination i.e. Class 10. Direct link to registration portal for Re-evaluation of examination Result – April 2018 has been given below. Step 2: Scroll down to the colourful menu and click on the blue tab saying Examination/Result. Step 3: A new window would open. Click on Result of April 2018 Examination of Sr.Secondary. Step 4: Enter reference number or enrolment number as printed on your NIOS hall ticket. Step 5: Hit Submit to view your result. Print using Ctrl+P or save as PDF for future reference. National Institute of Open Schooling, NIOS was established in the year 1989 by the Ministry of Human Resources Development. NIOS was formed with the objective to spread education in far-off places of the country. It operates on the concept of open tuition which gives the students an opportunity to pursue education without having to attend regular school. About 4 lakh students enrol themselves to the open examination every year, making NIOS the largest open schooling systems in the world.